It’s a Throw! It’s for Dogs! It’s Crypton Super Fabric! | Will My Dog Hate Me? It’s a Throw! It’s for Dogs! It’s Crypton Super Fabric! I’ve been a little down lately, what with my book going into a coma and my renewed need to keep an eye on Frankie’s diabetes medication. And — occupational hazard — I don’t have any extra money to spend on cheering self-indulgences. It’s true that, as a food writer, I often get free food, but every diet book in the universe cautions you against using food as a mood elevator. It’s also true that, as a pet blogger, I get a lot of offers to review pet products, but they’re usually items geared towards making Frankie happy, like food or toys, or they are deodorant shampoos and cleaning supplies designed to make it easier to co-exist with a stinky dog. 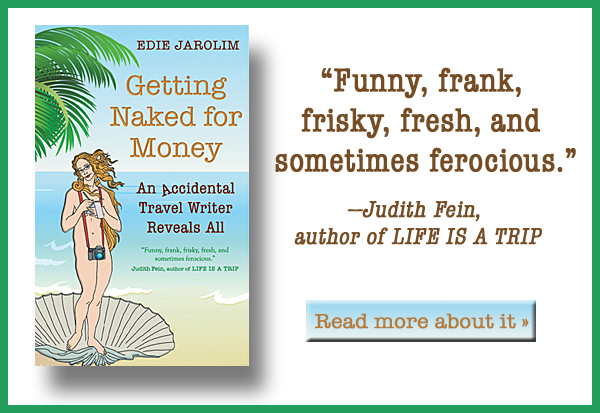 Even if Frankie were malodorous and dirty — he’s not! — these products wouldn’t bring me joy. Ever since I wrote the “Better Dog Homes and Gardens” chapter of AM I BORING MY DOG and discovered there was an ultra dirt- — and bodily function- — resistant fabric that was also great looking, I began coveting it. Also, the company that created it was ahead of the curve, gearing their products to pet people back in 2004 when Crypton commissioned William Wegman, pet photographer and artist extraordinaire — he’s known especially for his soulful Weimeraner images — to create some fabric designs for them. Sadly, the Crypton line was a bit beyond my budget. So you can imagine my excitement when I got an offer of a freebie. Being pushy, I not only said I’d love a Throver but that one with a William Wegman design would make me very happy. I considered giving the Throver a home in my car but, when it arrived, it was not only as great looking as I’d hoped, but it was also a turquoise, brown, and beige pattern that matched my living room perfectly. It kind of matched Frankie, too. 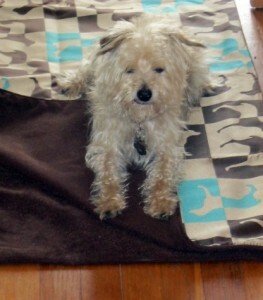 Frankie doesn’t generally pee inside the house, but there was one rug that seemed to invite him to lift his leg on it. I finally just got rid of it and got a cheap washable shag rug as a substitute. Frankie peed on that too — just once, but it made me think it was the location in front of the fireplace that inspired him to express himself, putting out an imaginary conflagration with real pee. Anyway, I substituted the Throver for the ugly shag rug and, as you can see from the picture. Frankie is as snug as a bug on it. Okay Mr. Innocent, go ahead and do your worst. I dare you! As you will have surmised, but in case there’s any doubt, I got this product for free. No one paid me to say nice things about it, however, or to take cute pictures of Frankie on it. I’m not giving it away in a contest. It’s mine. You can’t have it. If you want one, you’ll have to buy your own, for $99. It’s worth every penny. It’s reversible. Machine washable. And you can use it as a yoga mat. Your dog won’t mind if you borrow it. Ooo love this and it actually does suit Frankie! The Crypton products are amazing and it actually looks quite huge! It IS huge; what you see in the picture is folded in half. I’ve always said that getting a dog to match your furniture is wrong — I mean what happens if you want to change your color scheme? — but if a household item that just happens to match your dog falls into your lap… nothing bad about that. Holy crap, I love it! BUT $99.00….holy crap again! Haha! I wonder how it will do with dog hair. I would like something that would rinse off easily with a hose perhaps. I have pugs and they shed A LOT!!!! And I hate putting their blanket in the washing machine because it gets hair everywhere. The joys of puglets….but their cuteness makes up for it, regardless of what my husband says! Awwwwwwww…I loved the Pug Boat pic!!! I would much rather be on that boat than where I’m at right now….(work)! Haha. Cute picture. We’re having a no-room-in-the-budget month there too, so I can sympathize. Enjoy. Everybody needs something new once in a while. Oh, so lovely – I have coveted a Crypton blanket or dog bed for years now but again, more than my wee budget can manage. Just last night I bought a vinyl king size mattress cover for my one remaining couch to help it last a bit longer. Am counting the hours till it is chewed up and spat/pooped out. Hmmm, maybe I can tell those nice people at Crypton about you and how it would help your rescue… I sent them the link to this story and, when I hear back, I’ll make a suggestions. Yeah, but Frankie doesn’t really enjoy being thrown into the washing machine. As for freebies… it’s the reward for regular writing/blogging. There is no such thing as a totally free lunch/Throver. Ha! If Frankie gets tired of it, I happen to know a couch that it will suit just fine. I have far more accidents — sometimes involving red wine — than Frankie. Frankie looks adorable on that mat. It does match him. I can’t believe it’s only $99.00. I definitely want to have one, too. It will be good for my yoga sessions. I am so jealous of your very cool doggie throw! All I ever get is dog food or books, but I suppose that is my punishment for living in Canada. Thank-you for the lovely shout out! I loved the Pugboat pic! This sounds like an amazing product. I need a throw for my leather couch (because I’d rather adapt the furniture than miss out on snuggle time with Bella). This may fit the bill! Of course — it would never occur to me to keep Frankie off the furniture; even if he doesn’t snuggle, it feels like he’s keeping me company while I watch TV. I would definitely check into these throws; there are lots of great patterns and colors. If my Human got me one of those, I would MIND if she wanted to borrow IT! Believe me I WOULD! I have been looking for a throw/blanket for the back of my car (with seats down) My ideal was the dog blanket Costco put out 5 or 6 years ago, but like all great ideas, has been discontinued. Very interested in the throver, but worried it would bunch up and poor elderly Pupper would skid around the back. Hope Frankie enjoys his designer rug! When the Throver people contacted me, it was to ask me if I wanted a throw for the back of my car. My car is too trashed for me to want to gussy it up but there’s still hope for my home. One side of the Throver is more adhesive than the other side; it’s a suede-type fabric. But anything that’s not anchored would slide around, no? Is there no place you can tuck it in or attach it? It’s quite large; I folded it in half for my floor because it would have taken up too much space. Frankie only cares if treats arrive when he’s sitting on his designer rug. He has no aesthetic sense! Good point! I can sew elastic to hook it around the seat back (or something, I’ll have to check the car) It is much handsomer than these cargo liners I’ve been looking at. Pingback: If a dog barks in the blogosphere….